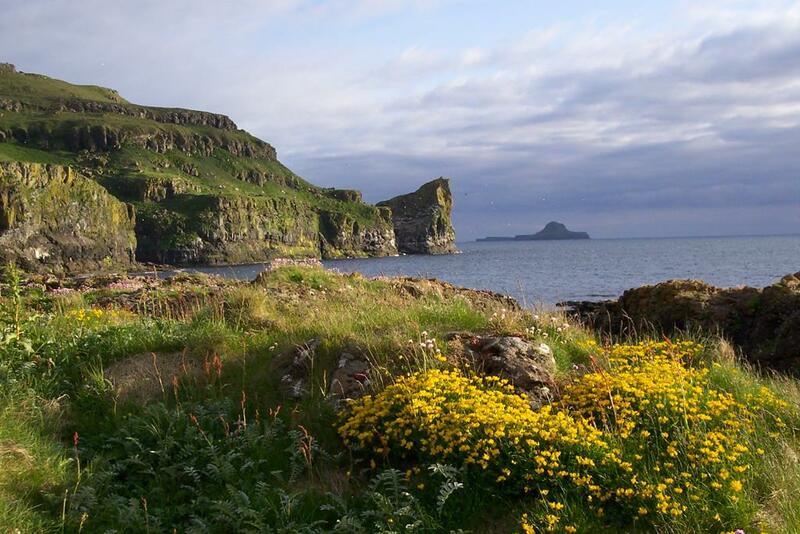 The Treshnish Isles are formed from 8 principal islands varying in size from less than 4 hectares to 60 hectares. The archipelago lies, at its closest , 3 km wets of Mull and extends along a northeast-southwest axis for a distance of 11 km. 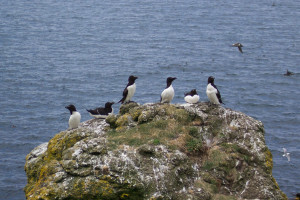 castle as well as large colonies of breeding seabirds. In autumn they are the breeding ground of Atlantic grey seals, which give birth to their white pups along their shores. 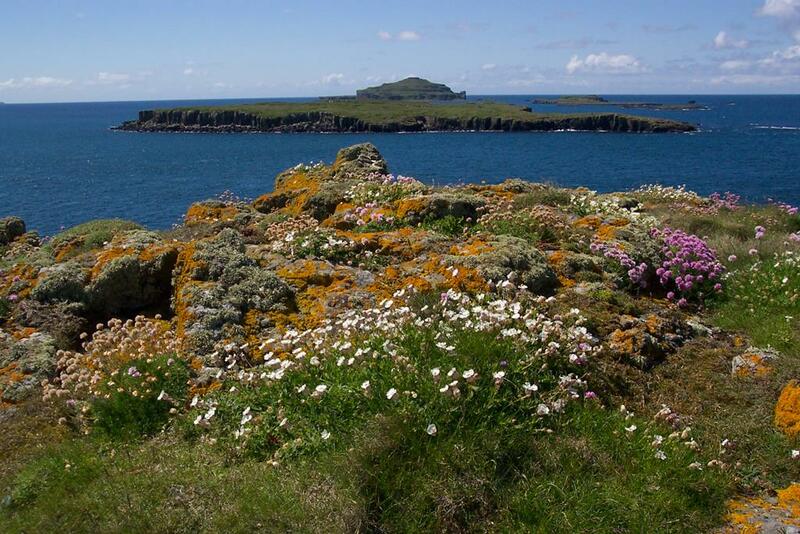 Naturalists began to realise the importance of the Treshnish during the first half of the 20th century and in the 1940's Niall Rankin purchased the islands in order to preserve and study their natural history. 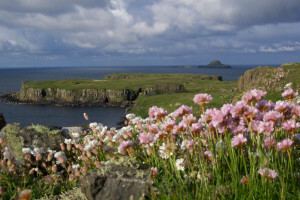 Following Rankin's death the island's faced an uncertain future until April 2000 when, with the assistance of a grant from The Heritage Lottery Fund, they passed into the stewardship of The Hebridean Trust. around Mull. This volcanism was associated with the initial formation of the Atlantic Ocean 60 million years ago. 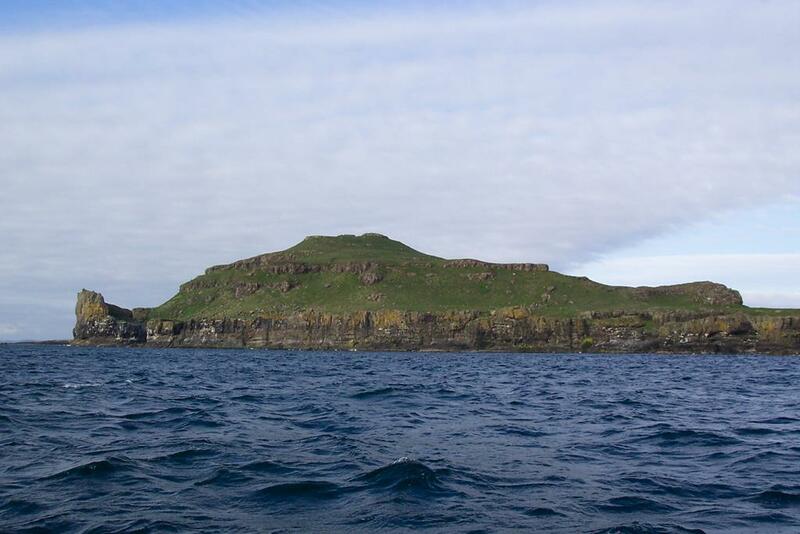 The Treshnish, together with Staffa are all that remains today of these once extensive plateau lavas. 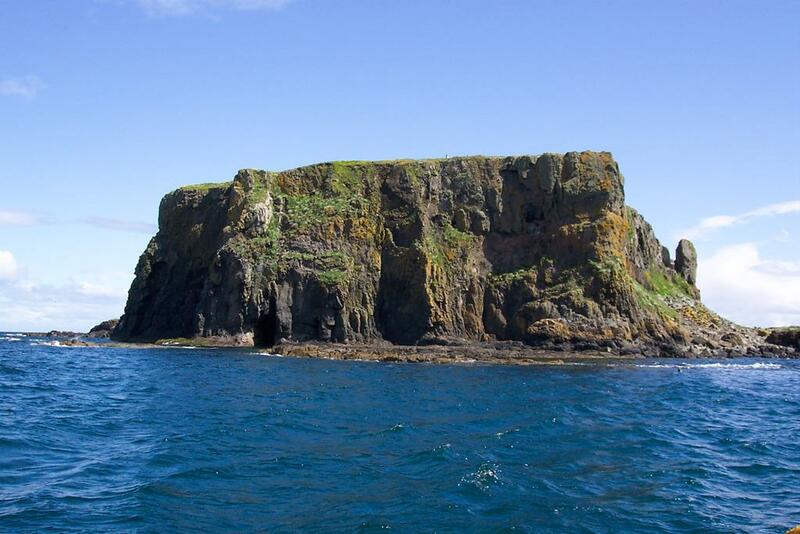 The evidence of the layering of the original lavas is still present in the sea cliffs around the Treshnish. The islands we see today were finally carved from the plateau lavas by the successive glaciations. 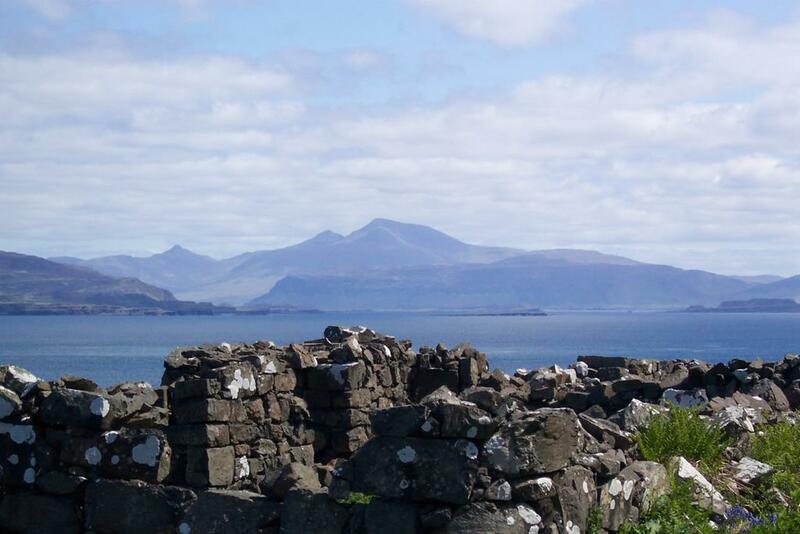 Glaciers from Mull itself, but probably mainly flowing down what is now the Sound of Mull from the central massif of Scotland, scoured out most of the lavas leaving only small remnants, which mainly include the Treshnish Isles. top of which was once a broad beach or shallow reef. Overlying this geology and geomorphology is a rich natural and human history. 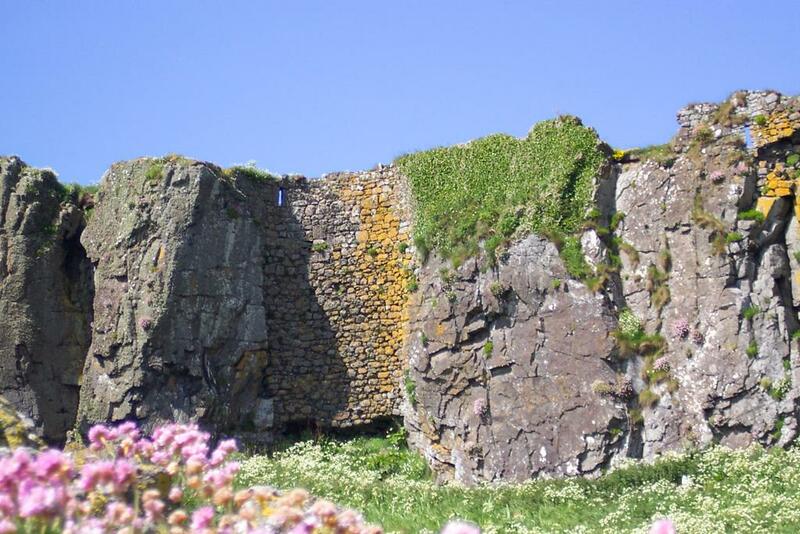 A medieval castle of national significance is present on the northern islands. Elsewhere there is ample evidence of human occupation across the centuries up to the time that the village on Lunga was abandoned early in the 19th century. 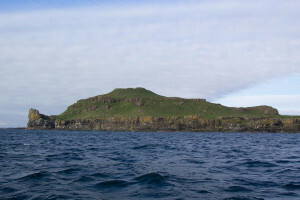 This includes sheilings on the Dutchman's Cap, a possible early Christian chapel in Fladda, and a corn kiln and possible whisky still associated with the abandoned village on Lunga. the size of swallows", are highly secretive and, to avoid being eaten by gulls, they only come ashore at night from the deep ocean where they feed. During winter, the islands provide valuable grazing for barnacle geese and in the autumn, the beaches are breeding habitat for nationally important populations of Atlantic grey seals. 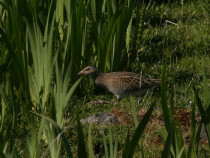 In early summer, it is also possible to hear the rasping call of corncrakes (witnessed and photographed by Jane in July 2005) on Lunga. abandoned village and the incessant call of sea birds give the islands a mystique and atmosphere of their own. Even today, the difficulty of landing and the isolation mean that some of the islands are rarely visited whereas others are visited by many thousands of people each year. 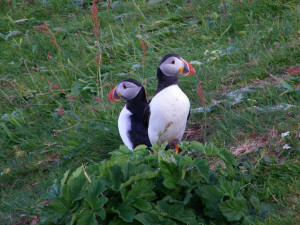 In June 2005, John and Andrew visited Lunga and some of the other Treshnish Isles in our boat 'Wanderer' and were fortunate enough to spend a day and night camping on the island photographing some of the stunning views, township ruins, medieval fortress remains, flora, fauna and bird life. Cairn Na Burgh More (Cairn of the Big Castle), Cairn Na Burgh Bed (Cairn of the Little Castle) & Cairnburgh Castle. 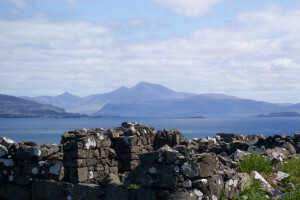 mainland of the Isle of Mull. 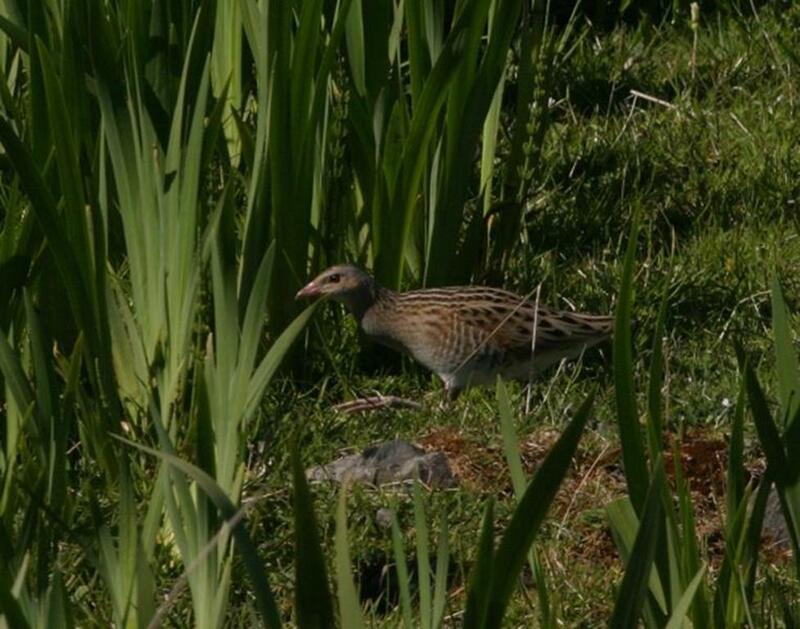 Today it is an area of outstanding scenic beauty and a safe habitat for birds, flora and fauna. In the past this site was of great strategic importance with a medieval castle of natural significance commanding the main inner west coast sea lane and Inner Hebrides. In the early Viking times it was called Kiarnaborg, and then altered to the Gaelic of Cairn na Burgh and today it is known as Cairnburgh. 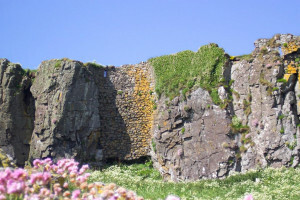 The first known record of the castle was in 1249 when it was listed as one of four castles held by ‘Ewen’, Lord of Lorne, whose benefactor was King Hakon of Norway. Thereafter during the next four centuries because of its strategic and political significance it was held and fought over by various clans, including the MacLeans of Torloisk, MacLeans of Duart, the MacDougalls and the Campbells during clan disputes, civil war and the Jacobite Rebellion. The islands are separated by a narrow channel which has a strong tide. 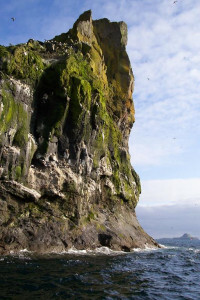 The sheer cliffs, particularly of Cairn na Burg More rise to thirty five metres from sea level making it a magnificent natural defensive structure. Where the cliffs are lower or there is a ravine, curtain walls have been built between the cliffs to complete the defensive line. The walls 1.4 metres thick consist of random rubble masonry laid in lime mortar with evidence of dressings of Carsaig sandstone. Where there is a ravine, the summit has been made inaccessible by carrying the curtain wall down to the cliff base. The chapel and barracks are situated on the gently sloping summit 35 metres above sea level and today stand partially to wall head level. 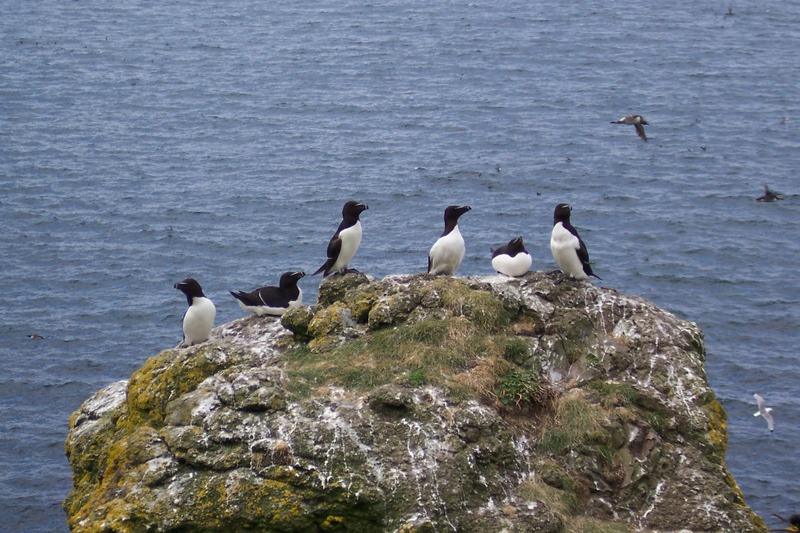 The islands are under the stewardship of The Hebridean Trust with financial aid and support from Heritage Lottery Funds. 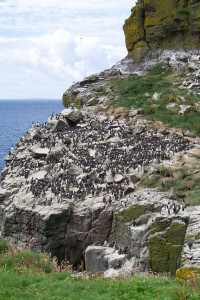 The islands are also designated as a site of special scientific interest under the Wildlife and Countryside Act 1981 because of their unique geomorphology, seals, wild birds, wildfowl and house mice. 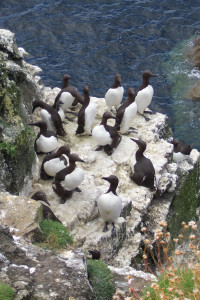 The Hebridean Trust state that the Isles have unique landscape, rich wild life communities and contain habitat which is vital for several vulnerable species. 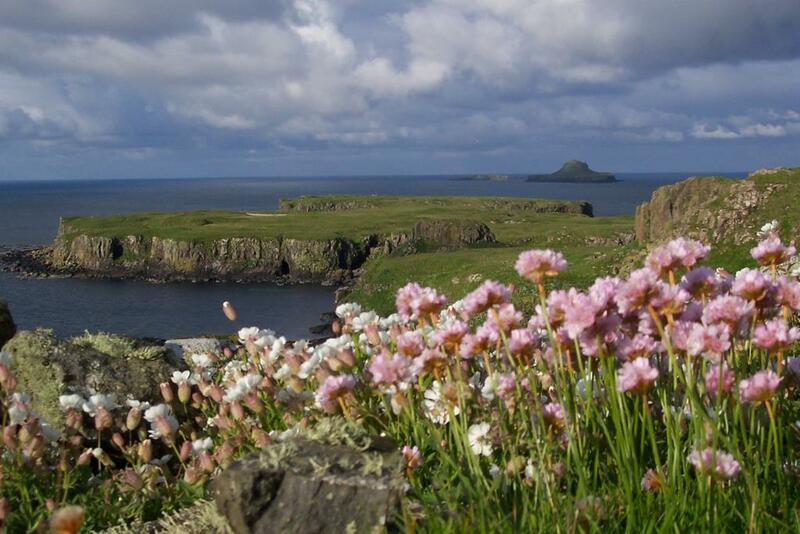 The Hebridean Trust is a charity and it does not charge people for visiting the islands. It cannot take responsibility for the safety of people who choose to visit and it does warn visitors that the Treshnish Isles have dangerous cliffs and coastlines. During your visit it is important to observe some basic guidelines. Please remember you are a guest on the islands and that because the islands are uninhabited you are an alien in this environment. You should endeavour at all times to minimise the impact of your presence while also bearing in mind that even small impacts when multiplied up amongst all those who visit the islands can amount to spoilation. You are asked to avoid dropping litter, disturbing wildlife or walking away from the paths. The livestock on the island are wild animals and should not be disturbed or approached. 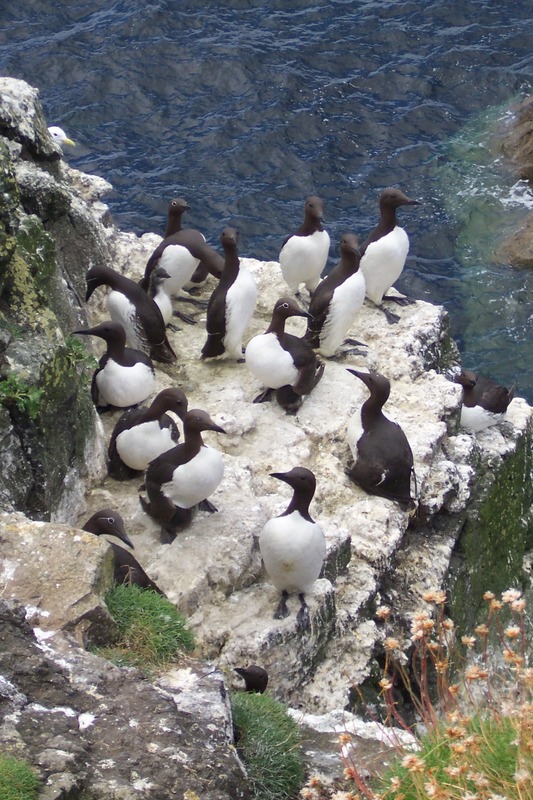 In particular during the seabird breeding season, we ask that you do not leave the paths to obtain a closer view of the seabirds. Rather than leave the path visitors are encouraged to sit and wait for a while and observe from an appropriate distance. Please do not climb on old walls or move stones - this can damage a valuable archaeological site. Take care at all times - do not take risks by approaching the cliff edges. 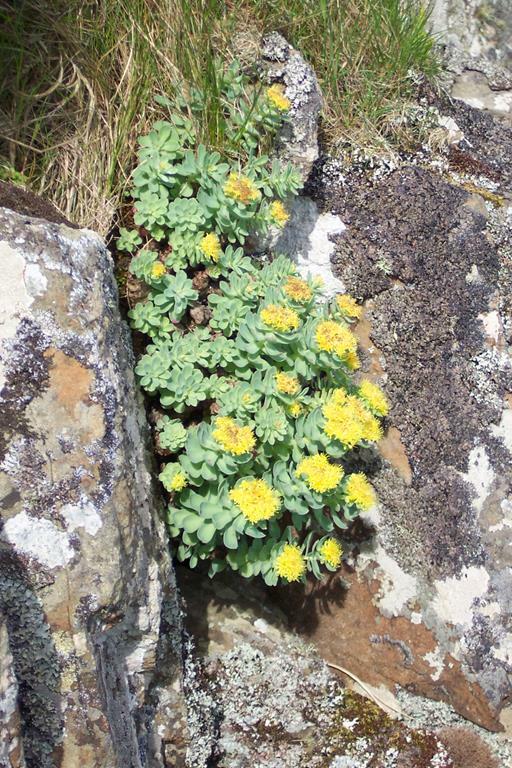 It is vital that no alien species are introduced to the islands. 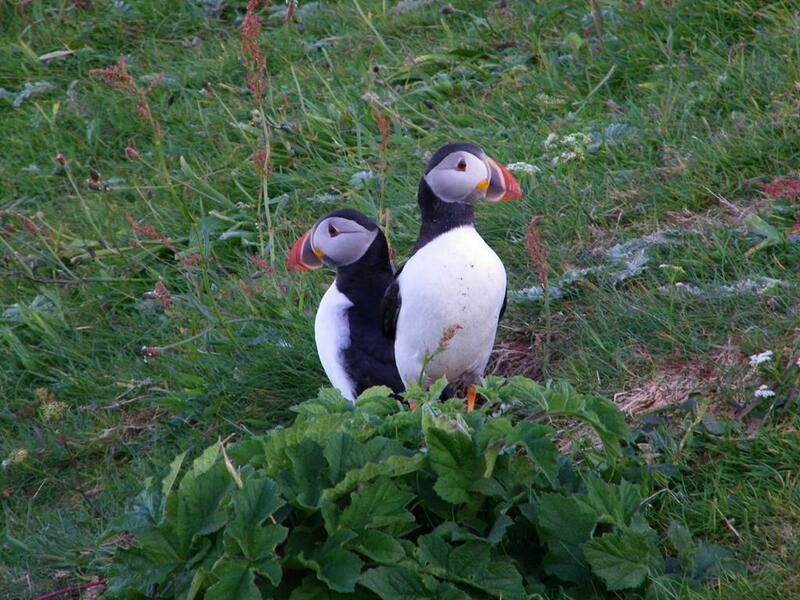 Rats, mink or cats on these islands would result in the death of many tens of thousands of seabirds, including all puffins and petrels. Dogs or other pets are not encouraged to visit the islands. the botanical diversity of the islands. All donations are gratefully received by the Trust. 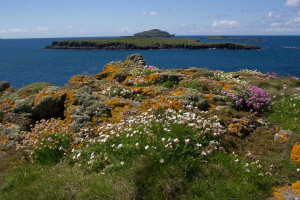 Gordon Grant marine of Iona operates a summer ferry service on MV Ullin and MV Ossian to the Treshnish Isles, combining a trip to Lunga and Staffa from May through to the beginning of August. The boat trips operate everyday except Saturdays, leaving Fionnphort and Iona at 12.00 and returning at approximately 5.30 pm. 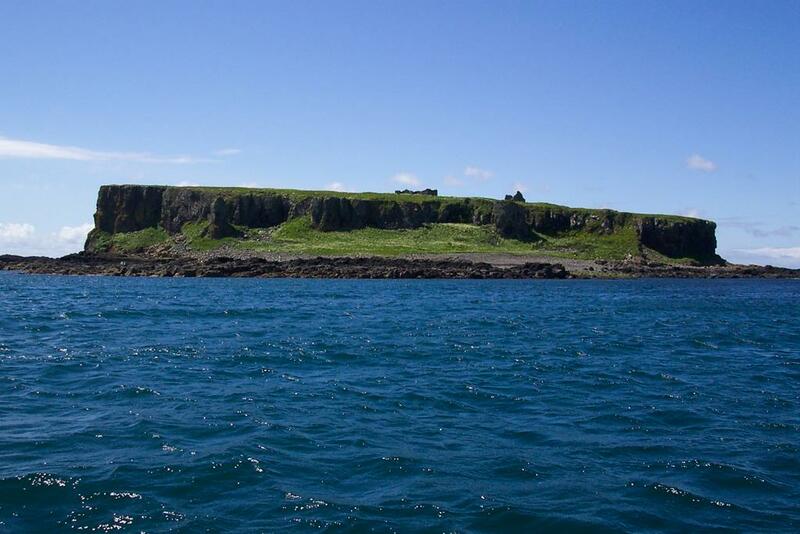 You will have approximately 2 hours on Lunga and 45-60 minutes on Staffa - all trips are weather permitting. Warm waterproof clothing and stout sensible footwear advisable. Also a picnic lunch as there are no refreshments facilities on the islands. Seaview bed and breakfast accommodation is ideally located 2 minutes from Fionnphort Pier.